Winter has come, that much is obvious. Mornings in some parts of the US could have outside temperatures in the single digits of cold. That’s not a nice environment to be in without thick winter clothes. In fact a sloppy choice of outdoor wear this time of the year can have some dire consequences for anybody staying out for prolonged periods, which is why people would be highly alerted when they come across a person wearing little clothing out during winter, especially if it appears to be an elderly. A situation that appeared just as I described it took place in the cold upper East Coast last week, but thankfully had a non-fatal – not to mention funny and inconvenient – ending. The Washington Post reports that a small panic rocked a neighborhood in Hudson, NY when a passing resident happened upon what a first glance was a morbid sight inside a parked car. 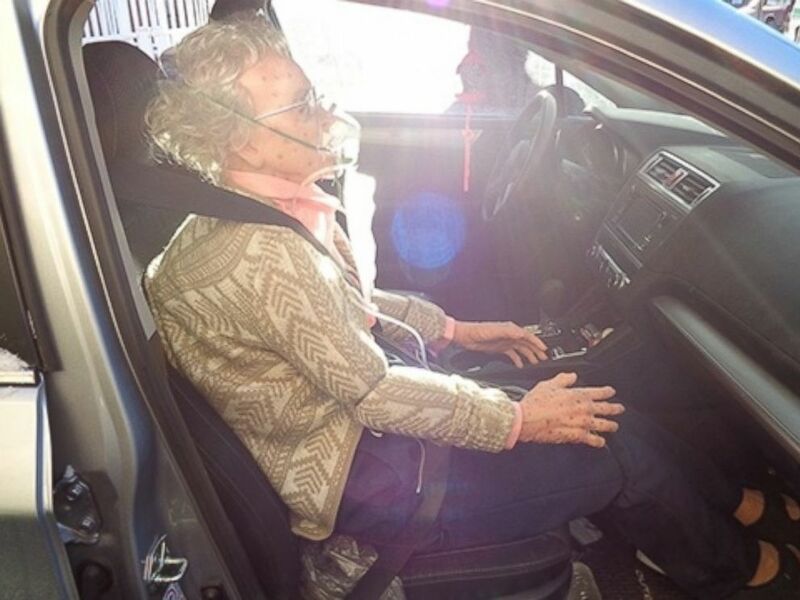 An old lady wearing non-winter clothing was strapped to the front passenger seat by her seatbelt. 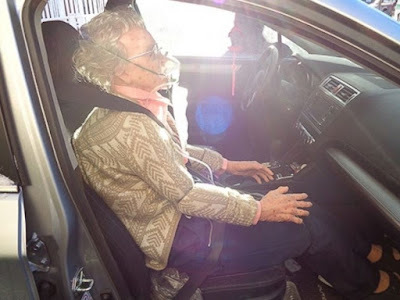 Although she had an oxygen mask over her mouth, the granny was still, arms frozen in midair, mouth open yet absolutely still, and didn’t appear to be breathing. With the temperature registered at 5°F and the car having been lightly covered by a blanket of snow, the panicked citizen called 911 Emergency. First responders quickly arrived on the scene, with the sole witness having described what she saw inside the car as an elderly person frozen to death. Hudson police on the scene attempted to locate the owner of the parked car, a Subaru. When their search turned up nobody, the authorities were left with no recourse but to breach the rear right passenger window, in order to get behind the apparently dead victim. It was here that the truth was discovered: the “frozen lady” was actually just a medical training dummy. But what a dummy it was too. Such equipment was used in first aid classes to practice CPR and other lifesaving techniques. But the “granny” dummy was remarkably sculpted, with hair, glasses, blemishes on the skin, in addition to the clothes. The manufacturer of that dummy sure took a dip into the visual uncanny valley. What a coincidence, around that time the car’s owner finally came around. Identification confirmed that he worked as a sales manager for a medical training aid company, and had strapped the dummy into his car the night before in preparation for a trip that same morning. He was pretty upset at the damage the cops had done to his Subaru on account of the “frozen lady”, but Hudson Police Chief Edward Moore suggested that people leaving life-size dummies in their vehicles ought to identify them as such, otherwise they can’t blame responders for breaking windows.